“Your generation has forced (via democracy) this and previous governments to divert as much money to your generation at the expense of other generations”. But this story is a myth! Like a fart in a lift, it is wrong on many levels. I am not denying that a few (certainly not all) recent government decisions favour the post-war generation. But similar government decisions over decades have favoured previous and later generations! There isn’t anything special about the post-war generation, unless viewed through selective prejudiced eyes. There is actually evidence (see “Counter examples” below) that the size of this cohort makes it harder for government to provide help for them (me). I have since published an article that complements and reinforces this: “Baby booms in the electorates of the last 6 Prime Ministers“. It shows that the immediate post-war generation were only a minority of the electorate for all elections. Is this what the post-war generation birth rate was like? That appears to fit the description: it is certainly a “baby boom” and runs from “1945-65″. But the truth is vastly different. Here are the figures from the Office of National Statistics for births from 1945 to 2004, but only including those surviving until 2004. 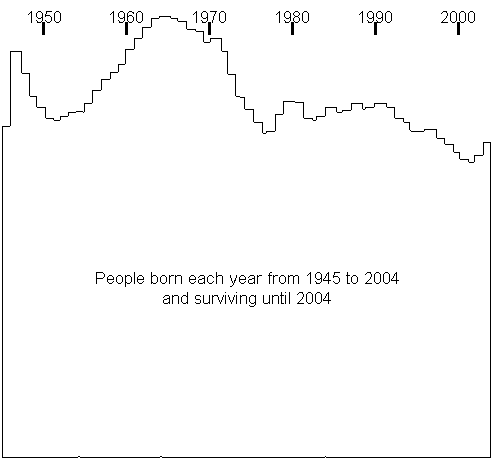 (Only about 81% of people born in 1946 are alive today). See “The myth of the UK baby-boom” on this blog for more details and citations for the original of the above diagram. 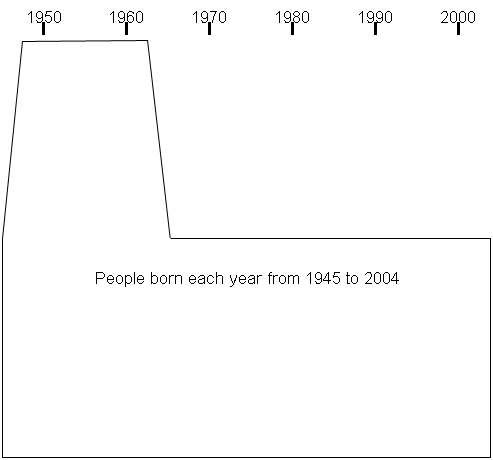 There simply wasn’t a “baby boom of 1945-65″! There was no “sheer demographic power”. “Baby booms in the electorates of the last 6 Prime Ministers” shows that this was true for all relevant Prime Ministers. It is necessary to re-examine political decisions in the light of these facts rather than according to the myth of a 1945-65 baby-boom. Inevitably there will be different conclusions. Reflect the worries and struggles of the electorate, saying “we understand your problems and desires”. If they don’t do this they are likely to be ignored. If that party is already in power, boast about one’s own past achievements, while if the party is not already in power, criticise the other’s past failures. Promise to help solve those problems if placed in power. So they identify the options available to voters. I have used an internationally-acclaimed political resource for this examination: Richard Kimber’s “Political Science Resources“, in particular “British Party Election Manifestos since 1945“. Governments don’t always fulfill their promises! But that doesn’t warrant blaming the electorate. Some of the problems that younger generations complain about are problems that political parties, voted for by older generations, promised to resolve but didn’t. And some of the things that the electorate voted for were not options at all, because they were promises of all important political parties. (And, of course, the post-war generation didn’t vote as a block. We often vehemently disagreed with one-another). I recommend having a look at some of these election manifestos, especially to anyone tempted to re-write history. They show an aspect of history written and frozen at the time. They offer a glimpse of the world within which older generations were making their decisions that are sometimes criticised with hindsight by later generations. Would the people of those later generations have made different decisions had they been in that world? I doubt it! “Your generation has forced (via democracy) this and previous governments to divert as much money to your generation at the expense of other generations. 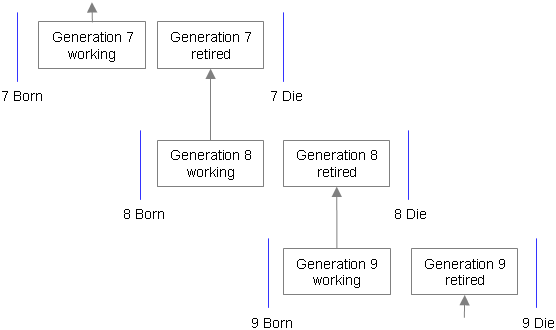 The most glaring example is that the state pension-index link was broken in 1980, it was re-established in 2010 along with a host of other pensioner benefits that your generation has awarded itself. Timing is the key to generational fraud. Cut pensions one decade, increases them in three decades time”. But the electoral manifestos contradict this story. They show that major political parties have been promising to improve pensions since the post-war generation were first able to vote, and even earlier. But in those days, the people whose pensions were being improved were born long before the First World War! Such promises, which the post-war generation voted for because there were no alternatives, have been pretty constant in most or all elections since the Second World War, and are not a special feature favouring just the post-war generation. This was long before any of the post-war generation could vote. (Votes were from age 21 until this reduced to 18 in 1969). Many of the promises are barely understandable nowadays! Apart from special cases, these pensioners were born long before the First World War. Conservative (previously in power): “preferential treatment to the older pensioners”; “retirement pensions should be more closely related to individual earnings”. Labour: “The right to full transferability of pension entitlements”; “Existing National Insurance benefits will be raised and thereafter linked to average earnings so that as earnings rise so too will benefits … The “ten shilling widow” will have her pension restored to its original purchasing value”. This was the first general election in which a substantial number of the post-war generation (in fact, the “baby pop”) could vote. These pensioners were born before the First World War. Conservative: “Between 1951 and 1964, Conservative Governments increased pensions five times, and the real value of the basic State pension rose by 50 per cent. We will review retirement pensions every two years to ensure that they at least maintain their purchasing power and that pensioners’ living standards are properly protected”; “Our proposals will be fair to those who are now old, and also fair to those now working. Under Labour’s scheme their pension prospects would depend upon the willingness of future generations to pay an ever-increasing pensions bill through mounting taxation. Under our proposal, a growing part of the future cost of pensions will be met through genuine savings”. Labour (previously in power): “Three increases – the last in November 1969 – have substantially raised the real level of retirement pensions … Labour’s new Pension Plan will, therefore, incorporate radical concepts in social security … Labour’s scheme is designed to abolish poverty in old age by enabling every worker to qualify for a pension at a level where supplementary benefit is no longer required”. Conservative: “We will honour the increases in retirement pensions which were promised just before the election. We will exempt war widows’ pensions from tax and provide a pension for pre-1950 widows of ‘other ranks’ who do not receive one at present”. Labour (previously in power): “Pensions are up by 20 per cent in real terms … As a next step towards a married couple pension of half gross average earnings and a single person’s pension of one-third gross average earnings, increase pensions in November to around £35 for a married couple and £22 for a single person”. There is a story, (which is rather implausible, but some appear to believe it), that the post-war generation “fixed” the housing market and the rate of inflation in their favour. By inhibiting house-building, and causing higher rates of inflation, the prices of the houses they had bought were driven upwards and it became easier to pay off their mortgages. There is no doubt that the rate of house-building had long been too low, and that inflation was too high during important periods. But the electoral manifestos show that typically the major political parties repeatedly promised to build more houses and to keep inflation low. So this is what the post-war generation had to vote for because there were no alternatives. If this implausible story is to be repeated, the question that must be answered is “how did the post-war generation do this, given that governments were elected on promises to build more houses and keep inflation under control?” What specific things did this generation do that caused these things to happen? Conservative (previously in power): “Since 1951 homes have been built at an average rate of 300,000 a year. We shall build about 370,000 this year. Next year we shall reach our new target of 400,000. This will be sustained, and will enable us to overtake remaining shortages, while keeping pace with the needs of a more prosperous, younger marrying, longer living and fast increasing population”. Labour: “Introduce a policy of lower interest rates for housing … Further help the owner-occupiers by providing 100 per cent. mortgages through local councils … Labour will also increase the building of new houses, both for rent and for sale…. we regard 400,000 houses as a reasonable target”. Conservative: “We seek a big increase in the programme of modernisation of our older houses”; “We will make both the 100 per cent mortgage scheme and the mortgage option scheme more flexible”; “Our vigorous new housing drive for the 1970s will have three main objectives: To house the homeless, to concentrate on slum clearance and to provide better housing for those many families living without modern amenities … To bring about a great increase in home ownership so that the majority of our nation fulfil their wish to live in a home of their own … To see that the tenant, whether of a private property or of a council house, receives a fair deal”. Labour (previously in power): “There should be decent housing for everyone; slums and overcrowding must be dealt with”; “Housing has been and will continue to be a main priority of Labour’s social policy. …. A new and more generous system of housing subsidies has made possible a major increase in council building and many families have been helped with house purchasing”; “Housing Priority Areas: All these areas of special need are within housing priority areas which will continue to receive special help in house building. The development of existing English new towns is continuing”. Conservative: “Unlike Labour, we want more people to have the security and satisfaction of owning property … As far as possible, we will extend these rights to housing association tenants … As well as giving new impetus to the movement towards home ownership, we must make better use of our existing stock of houses”. Labour (previously in power): “We must keep a curb on inflation and prices. Inflation is our enemy because rising prices hit most hardly at the pensioner, the low paid and the housewife, and inflation causes loss of jobs … The rate of inflation has been brought under control…. Now, with the renewed cooperation of the trade union movement, Labour will continue the battle against rising prices. With the wholehearted backing of the TUC, we have set ourselves a new target, to get inflation down to 5 per cent by 1982″; “Labour will also promote an expansion in housing”. There appear to be cases where being in a large cohort is a disadvantage. Some improvements can’t be afforded because too many people would have to be helped. A new higher flat rate state pension is proposed, but it won’t apply to existing pensioners, only younger people becoming pensioners in future. The Dilnot proposal for a cap on pensioner’s long-term care is floundering, and if implemented at all will probably be inadequate. It appears that the state can’t afford it. (The raising of the state pension age for women to match that of men was done on “equality” grounds rather than specifically because the current level was unaffordable. But no doubt there is relief that the women in the 1955 to 1974 “baby boom” will have to wait 5 years longer). Also, what these cases show is that government is not afraid of disappointing (even enraging) pensioners! Anyone who had tried to influence government policy (as I did for nearly a decade) knows just how hard it is to do so as a “normal citizen”. You really need to be in government yourself, or at least be highly active and influential with government. Even then success is patchy. The post-war generation didn’t unduly influence governments to do anything! We simply lived in a country where things happened that we barely understood and had virtually no control over. Perhaps 99% of us never had our hands near the levers of power. (I have never lived in a ward or constituency where my vote could make the slightest difference to who got elected). Even politicians in those days probably had far less information than is readily available now. No world wide web; no Freedom of Information Act; little or no demographic modeling by think tanks, etc. We weren’t coordinating our (mythical!) activism via Twitter … or email … or fax! (Some were doing so via the unions, but I don’t think they were opposing better pensions or house-building! They were tending to drive inflation up, so they had to be emasculated, and some of us in the post-war generation voted for that). Hardly any of us could plausibly have predicted the strategic consequences of our actions. Who could have predicted the large increase in single people wanting their own house? Or the amount of immigration? Or the increase in longevity? We simply did what appeared sensible at the time, which was probably what today’s younger people would have done had they been in that situation. What I’ve shown here is that the demographics of the post-war generation are not what most commentators assume. There was no “baby boom of 1945-65″. I’ve shown that the normal method of influencing governments, by voting at general elections, didn’t offer the option of achieving what people criticise the generation for. So the post-war generation typically voted right from the start for better pensions for everyone, not just themselves; for more houses to be built and for house-buying to be easier; and for inflation to be kept low. There weren’t alternatives to vote for!